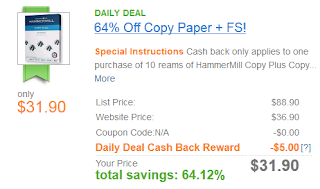 This Shop at Home deal for Quill.com gives you 64% off copy paper and free shipping. 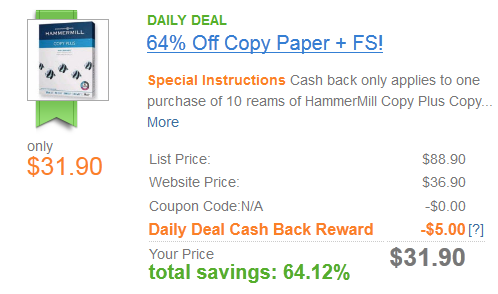 You pay $36.90 out of pocket for 10 reams of paper, then get back $5 cash back in your Shop at Home account. You must go through Shop at Home for this deal. 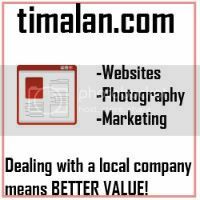 If you do not have an account, sign up below! I use Shop at Home regularly for my online shopping and I get a check when my account reaches $20. My last check was almost $30 and it was just from my regular online shopping.